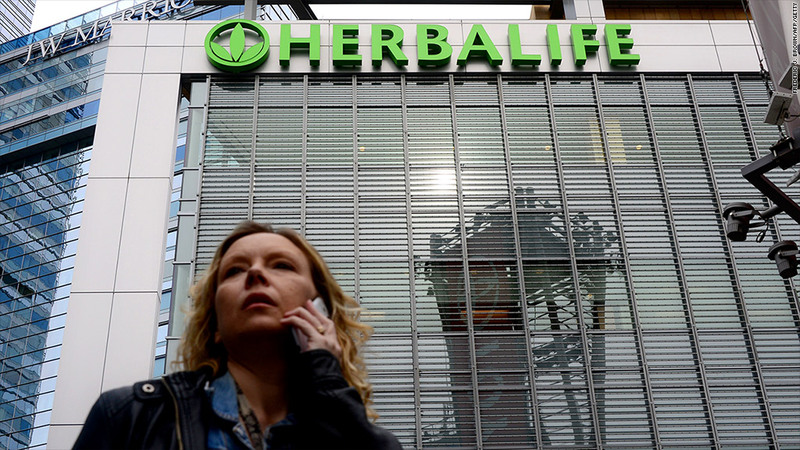 Herbalife is being probed by federal trade and law enforcement agencies. Despite several government investigations into the legality of its business, Herbalife was whistling a happy tune Monday when it released its quarterly results. The controversial maker of diet and nutritional supplements reported stronger than expected profits and announced plans to suspend its dividend payment in order to buy back more stock, which is generally viewed as a sign of the company's confidence about the future. Shares of Herbalife (HLF) spiked in after-hours trading, though the gains didn't last long. Herbalife said its rosy outlook excludes any costs related to an investigation by the Federal Trade Commission, which the company disclosed last month. Herbalife is also being probed by federal law enforcement authorities, sources confirmed to CNN last month. And the attorney general in Illinois is reportedly looking into Herbalife as well. The company's business practices have been heavily scrutinized ever since hedge fund manager Bill Ackman first called Herbalife a pyramid scheme more than a year ago. Ackman's Pershing Square Capital Management hedge fund has a $1 billion bet the company's stock price will fall. Herbalife sells nutritional supplements and other products via a global network of independent distributors. Ackaman argues that Herbalife is a pyramid scheme because it makes more money by recruiting new distributors than it does selling products to consumers. He says the company deliberately targets Latinos and other vulnerable immigrant groups. Herbalife has repeatedly denied that it operates as a pyramid scheme, saying its business model is no different than other multilevel marketing companies, such as Avon (AVP). It says Ackman's attacks are baseless and that he is trying to manipulate Herbalife's stock price. The two are set to clash again this week. Herbalife executives will discuss the company's results in a conference call with analysts Tuesday. The company also kicks off its annual shareholder meeting tomorrow. Meanwhile, Ackman will renew his fight against Herbalife on Friday with the release of a short documentary featuring former sales people who feel victimized by the company. Ackaman's aggressive tactics have been criticized by other investors, including rival activist investor Carl Icahn, who is Herbalife's largest shareholder. A report by ABC News last week said Ackman promised to pay a disgruntled former executive $3.6 million over 10 years if he lost his job because he provided inside information about Herbalife to government investigators and the media. The former executive, Giovanni Bohorquez, is now receiving $20,000 per month from Pershing, according to ABC. Ackman has also helped fund anti-Herbalife letter writing campaigns and donated to groups that support his cause, according to the New York Times.